After all the work of building our house, there wasn't much left in the budget for completing the outdoor living areas. For the first two years that we lived here, the area at our front entrance was just gravel and weeds. No matter how many times I went and dug up the weeds, and raked the area, it was still a pretty sad entrance to our home! 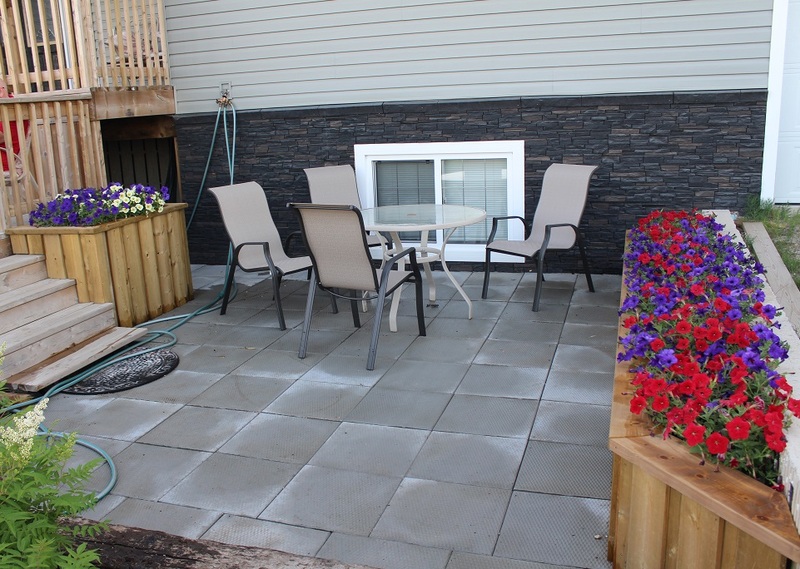 Paving stones and stacked block planters weren't something we could afford, so we had to find less costly materials to complete our patios. Concrete patio blocks aren't the fanciest material, but they served our purpose. Finally, the gravel was covered, and I didn't have to worry about it being tracked into the house! By the time the patio blocks were laid, I had come up with an idea of how we could cover the retaining wall by the driveway. I love how I can present an idea, and Brian comes up with the plan! 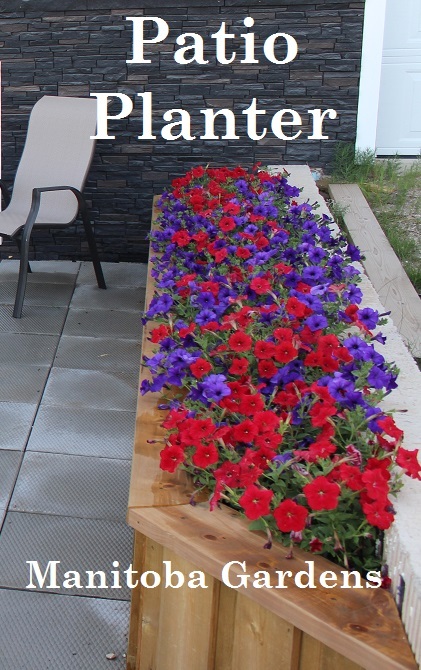 The planter is constructed from treated lumber, but lined with pieces of styrofoam insulation we already had. (scavenged treasures!) The purpose for the styrofoam was mainly filler, to save on soil, and also to keep moisture away from the wood. Landscape fabric lines the inside. The outside of the frame is covered with fence boards, and the cap is 2x6 treated lumber. We filled the bottom of the planter with sand, then a mix of peat moss, and soil. We bought a few bags of soil, to avoid planting weed seeds in our new planter. So far, it's worked; we have very few weeds! We still have to finish off the top of the concrete wall, but that's a project for another time. Brian built this next planter one day while I was away visiting my mom....I love coming home to surprises like this! It's built the same way as the one along the retaining wall, but because it's quite tall, we put some big logs in the bottom that will eventually break down. (our attempt at hugelkultur) As the soil settles, we just top it up each year. 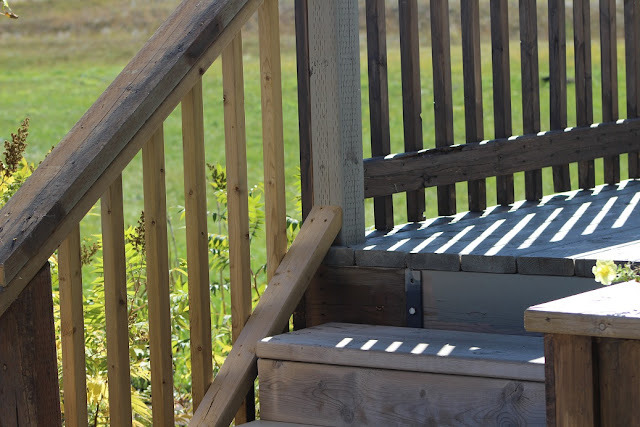 Planter beside the deck completed! And a handrail to make the building inspector happy! We filled the planter with petunias from a hanging basket. They fit perfectly and spread beautifully! Planters finished, filled and planted....another project done. Well, except the staining...that's a whole other project! Finally, a nice welcoming entrance to our home...just don't trip on the garden hose on your way in! I think those planters turned out really well. I have a few built like that from scrap wood and they have lasted for years and still going strong.Love the plants in them. I'm hoping ours last a long time too. The flowers are petunias...my favorite annual. It's really coming along! 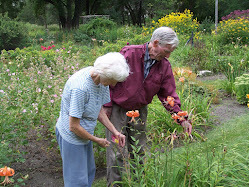 I remember feeling so impatient to have gardens in my new home. Now that we've been here five years, that seems so long ago!